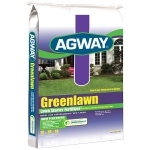 Agway® Greenlawn® products are the quality choice in complete lawn care. Developed and patented at Penn State University, the product is made from recycled shredded newspapers, a water holding polymer, and a balanced starter fertilizer for seed root development. 24-24-4 Grows new grass 75% thicker, 50% quicker. Kid and pet friendly. Water Smart. Improves lawn's ability to absorb water and nutrients. 24-24-4 Grows new grass 75% thicker, 50% quicker. Kid and pet friendly. Water Smart. Improves lawn&#39;s ability to absorb water and nutrients.